his prayer mat, or sajada, originally used for prayer, is one of the finest examples of embroidered arabesque and calligraphic design. A splendid work of religious decoration, this prayer mat is considered a precious object to the Islamic religion, the official religion of Kuwait. Prayer mats such as this are a traditional way for Muslims to create a space of concentration and cleanliness during their time of prayer. Following Islamic tradition, this prayer mat is designed with a specific “top” and “bottom”, the bottom of the mat a place for the worshipper to stand while the top points towards the direction of Mecca, Saudi Arabia. 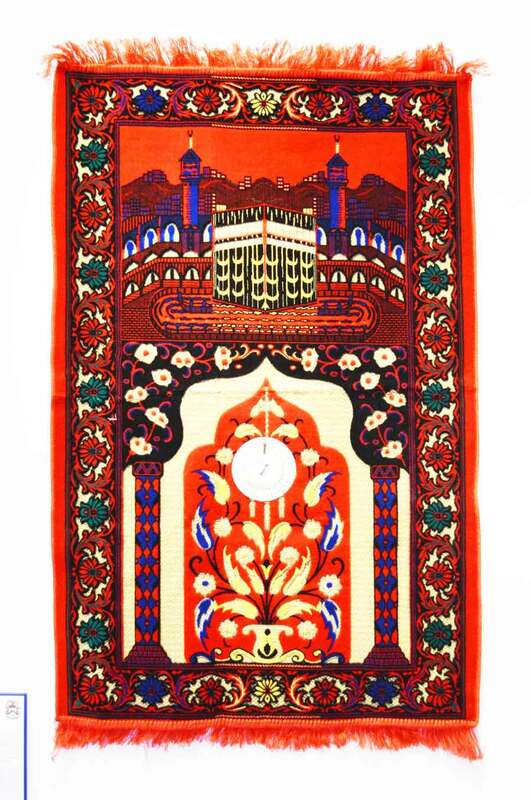 While prayer rugs vary in decoration they frequently feature a framed panel with twin columns supporting an arch that represents the mihrab, or niche in the wall of a mosque, indicating again the direction of prayer toward Mecca. Geometric, floral and Islamic designs run along the bottom and sides of the mat while the top of the mat is a depiction of the Ka’aba in Mecca, a traditional Islamic landmark. Considered a sacred and traditional object for the people of Kuwait, this prayer mat represents their rich religious history and traditional arabesque design.